Teaching With Heart: Sight Word Success! 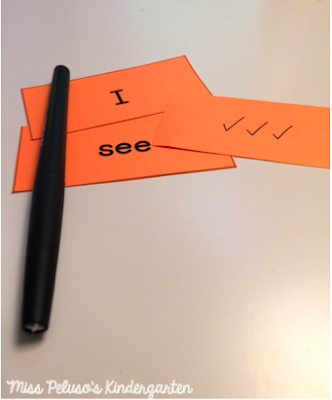 Over the past few years, I have tweaked and tweaked how I teach sight words to my class. I have finally found a "program" that my students and I absolutely LOVE! It is engaging, differentiated, goal oriented, and most importantly, SUCCESSFUL! I hope you'll come away from this blog post with some ideas that you can use in your classroom right away! Before any sight word instruction begins, I assess my students on our district's 30 kindergarten sight words to find out their baseline. I always have a range of kids, from some that know 0 sight words, to some that already know all 30! That probably sounds scary, but I actually love it this way! It allows me to help each of my students set individual goals, rather than one generic goal for the whole class. Once I have my baseline data, I create an individualized sight word "program" for each of my students. This is not as hard or as scary as it sounds! 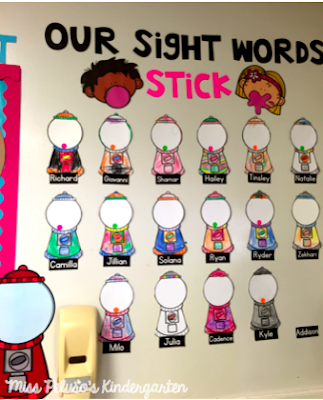 The short of it all is that we have 30 kindergarten sight words in our curriculum, but I am not going to waste time having my students practice the words that they have already mastered. I start by sending them home with the first set of sight words that they did not master. 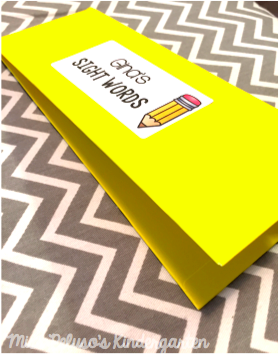 Their sight words get sent home in a mini pocket folder which gets sent back and forth from home to school each day. 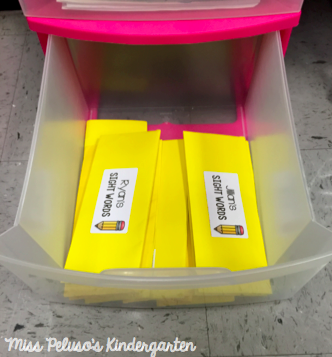 The students unpack their pocket folders each morning, and leave them in a bin. During the first 3-4 minutes of guided reading each day (while my students are doing their warm up), I pull out their pocket folders and test them on their words. If they get the word right, I put a check mark on the back of it. If they don't, I don't do anything. These same words will stay in their pocket folders until they have THREE check marks on the back of each word in the set. What do these sets look like? There are 3 word cards in each set. My team has found it beneficial to use words that can make a sentence (Ex. I, see, the). However, depending on your district's sight word list, you may not be able to make sets that make sense like that. That's okay! I would still stick to around 3 words in each set, though. 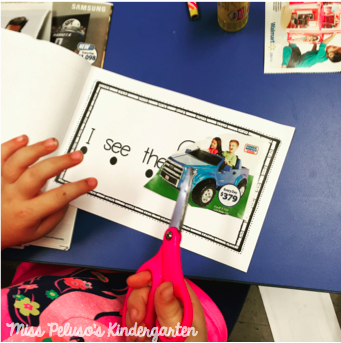 Each page comes with directions for the grown ups to cut out the sight word cards and practice them in ANY order with their child. By doing this, we can make sure that the child isn't learning the word in the order that is necessary for the sentence :)! Each day, when I test the student at the beginning of guided reading, I make sure to mix up the words as well. So, what happens to the sight word cards after they master a set? This is my FAVORITE part! Their sight words get hole punched and put onto a sight word ring. Each student has their own ring, which allows me to differentiate their word work time during Daily 5. 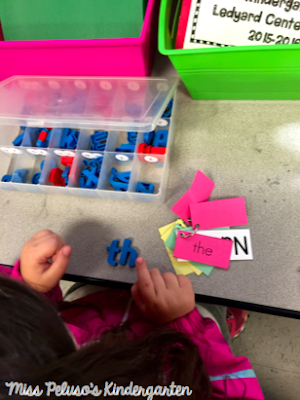 When my students go to word work during Daily 5, they take their individualized word ring and choose from the word work options (white boards, wikki stix, letter stamps in playdough, magnetic letters, rainbow writing, and letter beads) how they want to build the words on their ring. This is such an easy and effective way to differentiate, because I can have one of my kiddos working on the first set of sight words, while another one is already working on the first grade words! 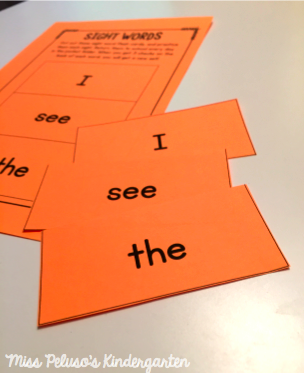 Regardless of what sight words each student is working on, I do introduce 3 sight words whole group each week. This way, even if students are still working on letters and are not ready for sight words yet, they are still being exposed to the words. We find these words in our morning message, notice it in books that we read during shared reading, and my students are always finding the words in their own read to self books! The last, and probably my FAVORITE [okay, I am too indecisive to pick a favorite!] part of our sight word program is our sight word chants! I made up little chants and movements to incorporate some whole brain teaching into our sight word instruction. It is amazing to hear my students chanting these little poems or songs when they are trying to write the word! I tried to explain them as best as I could, but if you would like a visual, feel free to email me and I'd be happy to send you an embarrassing a video of myself :)! Click on the picture to download them for FREE from my TpT store! 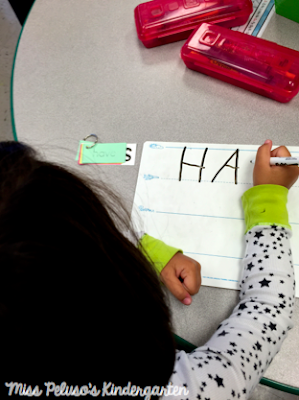 Want to try this sight word program yourself? Everything you need to get started can be found right here! I hope that I've given you some ideas that you can use as a jumping off point in your classroom! Feel free to leave any questions you have in the comments below, and I'd be happy to answer them :)! I would love to see your embarassing video! Lh25@comcast.net. Haha!!! Is there a specific sight word chant that you would like to see? Love these ideas. Can't wait to use in my class!!! Wonderful flexible and doable idea, am planning to use this with grade 3 also if I am called back and get a chance with them, shared it with my Co-Ordinator too so she can tell the team. thanks for sharing! Wow!! I am so in awe of every single one of these ideas!! I absolutely LOVE them!! I am going to start working on incorporating them into my classroom!! I love the word work station too! I have an "independent" table and this options would be PERFECT for my students to be able to choose while working at this table. 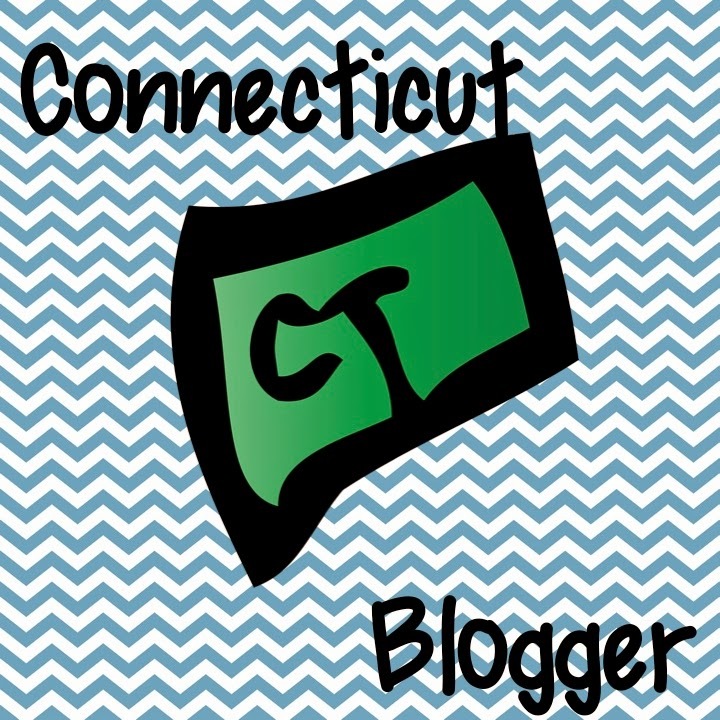 Thank you so much for such an incredible post with great ideas that are easy to incorporate!! 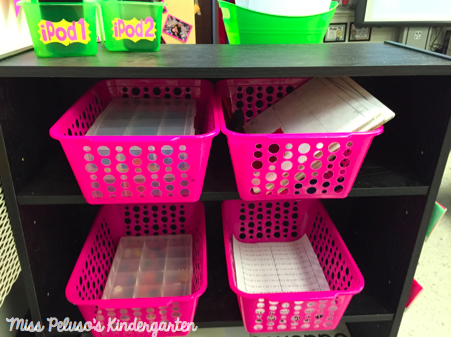 Love these ideas and they're great to incorporate even at this point in the year! 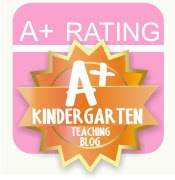 For your students that come in knowing all 30 do you start exposing them and giving them the next grade's sight words? Thanks for your great ideas! Hi Courtney! I'm so glad you like the ideas! Yes, if a student comes in knowing all 30 start words, they work on the 1st grade words! Thank you for these ideas! I read your post about making the pocket folders and was wondering if you still keep the sight words they've mastered in the other side of the folder? Trying to figure out if I should make double sets, one for their folders and one for the rings. Hi! Great question. I have done it both ways. I decided that making 2 sets was best, because then they can keep reviewing the words they have mastered in their pocket folder. Both ways work fine, so it's really up to you! I taught 1st grade for 5 years and K for 2 years and now am currently homeschooling my preschoolers...and i LOVE these ideas for sight words!!! Thanks for sharing! I am curious as to how you handle children who become upset if they have no gumballs while others have tons. 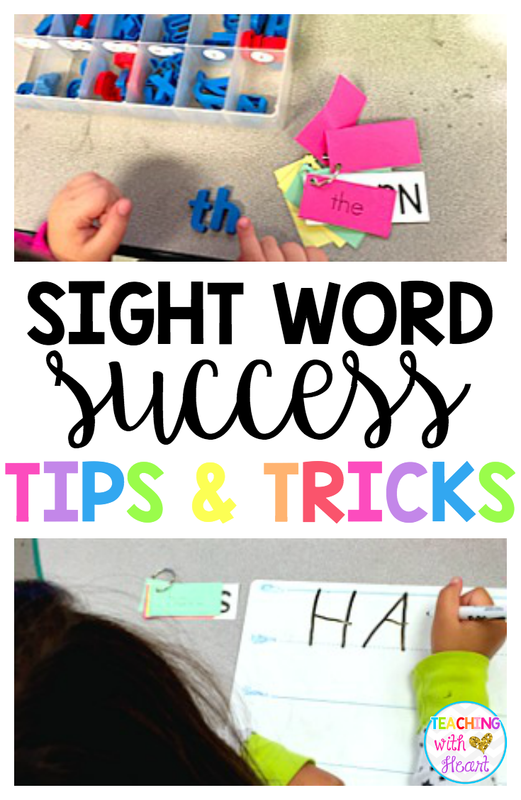 I have had children that take all year to learn even 10 sight words. This is the concern of our team in regards to data walls. Hi Stacey! Great question! I don't do traditional data walls for this reason. With this sight word wall, it is differentiated for the students. There are no circles to fill in on the original template for this reason. 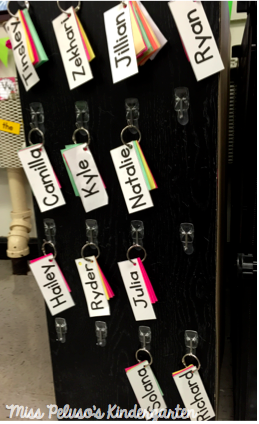 Each year, I have a few students who have not mastered letter identification yet. For this reason, I do not move them on to the sight word program. Instead, their pocket folder has letters inside. When they master each set of letter id/sound (I usually send home 3 letters at a time), they get a gumball in their machine. By doing this, the students working on mastering letter identification see their gumball machine grow just like the students working on their sight words! I hope that answers your question :)! Feel free to email me at teachingwithheartblog@gmail.com if you have any other questions!! I love the bubble gum display! Do you have that for sale in your teachers pay teachers store? 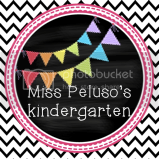 This product also includes everything you need to run your sight word program! I have the same question. Where did you find the bubble gum display title or is it for sale? I am curious if you send home a ring with mastered sight words with students as well? Or, do they just have the three that they are practicing? Hi Emma! I have started making 2 sets of sight words. One for their ring, and the other to keep in the "Words I Know" side of their pocket folder. This ensures that they will continue to practice these words! I love this idea!!! I love that it's individualized. I teach 2nd so I plan on doing sight words in the beginning and then vocabulary words as they move forward. Something I am wondering about is if the student masters a list, do you put the new list right into their folder to take home and be cut? Have you found an easy way to organize all of your lists so you can easily grab the new one that student needs? I am just curious about how to stay organized with this and keep up with who needs new lists and which list they need. Thank you so much for these great ideas!! Great questions! Yes, when students master a list, I put the new list in their folder right away. I find that printing them out, cutting the page in half (because there are 2 lists on a page), hole punching them, and putting them in a binder is helpful. I just use a regular sized binder and keep the masters in the back, but Target has cute mini binders that I saw the other day that would be the perfect size for the lists! It's my first year teaching 1st grade and I'm struggling with teaching my kiddos their sight words. Their reading fluency is lacking because of it! I am SO excited to buy your program and get to work! I am PUMPED! Can't wait to share my success with you!! What do you do when kids don't bring the words back from home? I have several kids who have taken the folders home and have never brought them back again. THerefore, they are not progressing. When I ask, they say they lost the folders. Hi there! Great question! I usually try one more time, and send a note home or call the parents stressing the importance. If that one doesn't come back, t make them a new folder and we keep it at school. They can always find a few minutes during the day (when they come in, during snack, after they pack up, etc.) to find a friend to review their words with them. This way, they can keep progressing through the program and no-one has to stress about where the folder is! Hope that helps! I don't really have a theme for my classroom more just a color theme. It does include alot of stars though. Any good ideas to incorporate stars like you do with gun and the palm trees? We start nack to school next week and I am so excited to do this with my little guys! Sight word instruction and differentiation was an area where I could have done better last year, so this is great!! I love this sight word program! Do you have a generic list of words that I can have. I don't know where to start. My school doesn't have a set list. We just need to know 50 words by the end of kindergarten. Thank you in advance. I love your sight word program!! !